I suppose it’s not surprising that someone who’s always been a little suspicious of cruises might sign up for his first with a company called UnCruise Adventures. 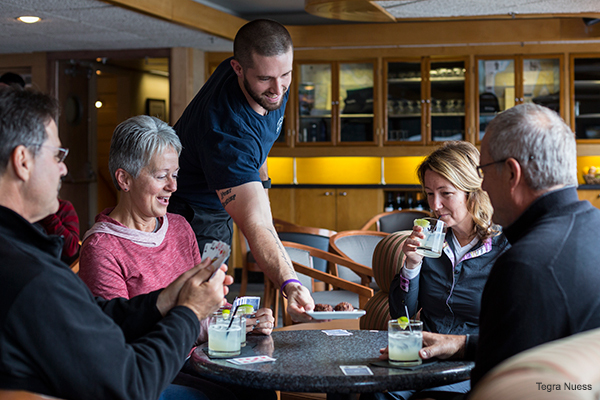 Emphasis on the “un,” as in unlike a lot of normal cruises involving a massive ship and easily a couple thousand people – ah, no thanks – the UnCruise experience tends to be more intimate. Guest capacity on my boat, the Safari Endeavour, totaled a whopping 84. Better yet, during my trip last January, less than 60 guests were on board. It wasn’t hard to get quiet time alone just about anywhere on the boat, and the way activities were structured made it easy to meet people. No small concerns for the introverted traveler. The real emphasis, though, was on activities – both on water and on land – in a starkly beautiful part of the world, where you’re refreshingly reminded that there is vibrant, teeming life beyond the Internet and even most of civilization. Add in the comforts of good food and a well-stocked open bar, and I’m sorry it took me so long to do something like this. 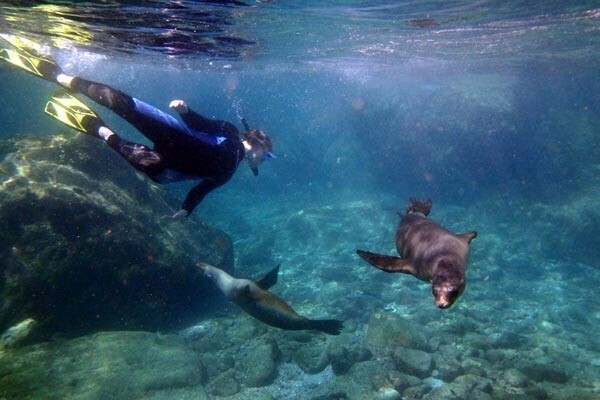 We started in La Paz, near the southern tip of the Baja peninsula. 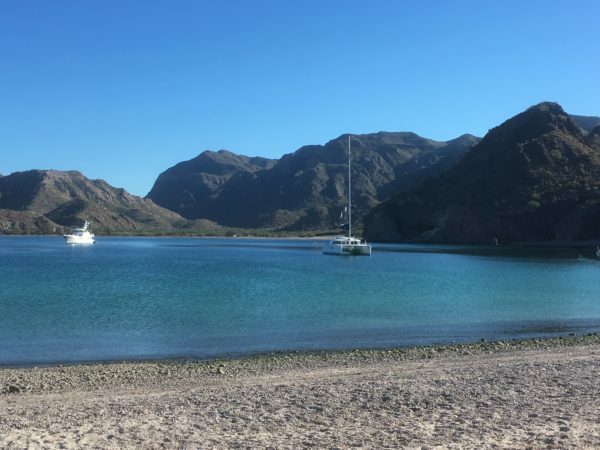 The itinerary took us up along the eastern coast in the Sea of Cortez (or, as we call it on this side of wall that may one day arise, the Gulf of California). We didn’t have ports of call lined up so much as coves where we would drop anchor, pile into skiffs, and speed to shore for some hiking or kayaking, or to some rock or reef where the snorkeling was particularly good. For six glorious days. Of course, you could also just lounge on the upper deck of the ship all day if you preferred, soaking up the warm rays of a brilliant sun. Or maybe while away an afternoon in one of the hot tubs with a book and a cold, frosty beverage. Activities were scheduled every day, but it was your choice what you wanted to do. And choosing was likely the hardest thing you did all week. 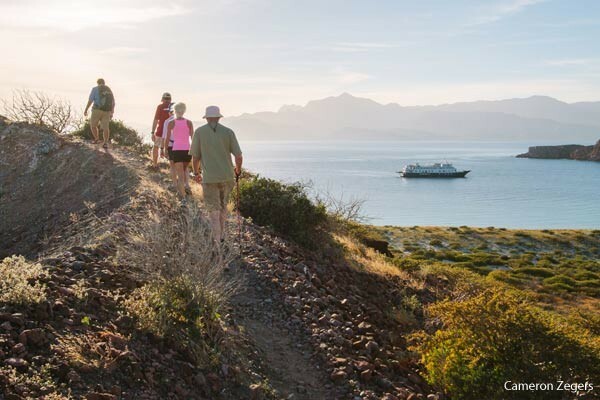 Sea of Cortez with UnCruise Adventures. Credit UnCruise Adventures. 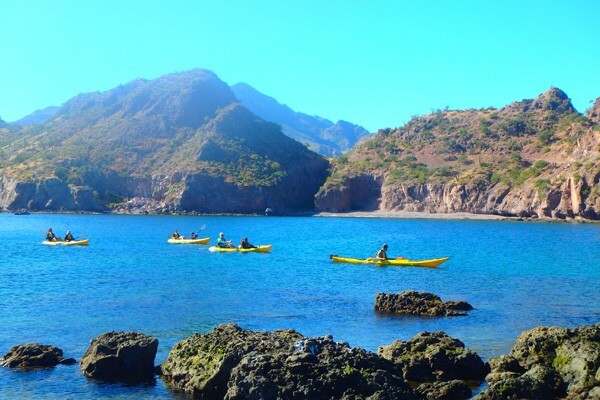 I’d never seen Baja before – more specifically, Baja California Sur – and its rugged volcanic rock the color of rust outlined with white sandy beaches and shallow turquoise waters was hypnotic. The azure canopy of sky added a serene, calming vibe. I spent more than one afternoon on that upper deck along with maybe one or two other people, simply gazing toward shore. I doubt there are many better ways to decompress from a life normally full of deadlines and meetings. Well, snorkeling, maybe. Can’t remember the last time I did it, but this trip convinced me I’ll be snorkeling more, especially if I’m ever in areas like Agua Verde again. Daytime temps usually hit around 70, but the water was a lot cooler. 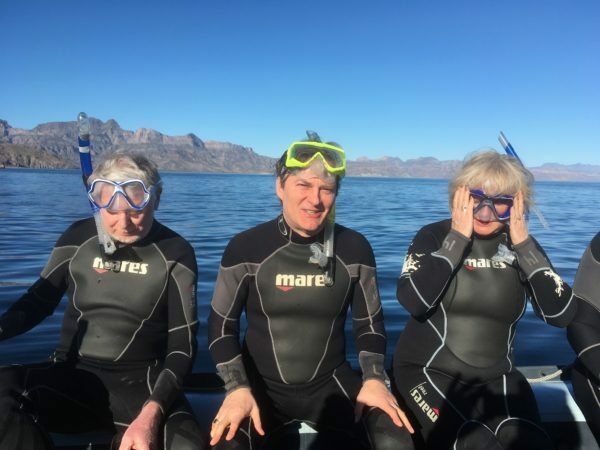 So we donned wetsuits, which allowed us to flipper around for about an hour. Darting among the rocks were a host of fish, including lemon-striped Sergeant Majors and iridescent King Angel Fish. Attached to some rocks was something that looked like a kind of Venus flytrap on steroids. I didn’t go too close to them. I often saw star fish, too, many in colorations that surprised me, like a mottled red-orange. It all made for an underwater kaleidoscope. Rides back in the skiff were pretty windy, sending a sharp chill through the wetsuit, which made a dip in the hot tub more or less de rigueur after getting aboard ship. We all shared with each other stories of what we saw, and then usually drifted into silence, enjoying the warmth. Hedonism at its finest. Sea kayaking. Credit UnCruise Adventures. Kayaking was another good way to decompress. In fact, every activity was good. But for someone who loves being on, in, or near water, paddling around on a table-top smooth cove hemmed in by rocks and cliffs amounted to a near-Zen experience. The gentle lapping of the oar, the whisper of a breeze, and only a few people on the beach were beyond relaxing. Pretty much the only reason I eventually headed back in was to crack open one of the beers the crew had brought ashore in a large cooler. Sea lion pups. Credit UnCruise Adventures. Then there was hanging with sea lions. A string of rocky islets known as Los Islotes is home to a colony of some 400 of the hammy, playful animals – especially the pups – who zip through the water, often leaping into the air, as if on cue. When you snorkel among them, it quickly becomes clear that they’re as curious about you as you are about them. We were warned not to try touching them, though. What a sea lion considers a playful nip can cause more than a little pain. To watch them and even goof around with them to some extent in their own habitat was something I’ll never forget. From sea lions we graduated to whales – gray whales, to be exact. 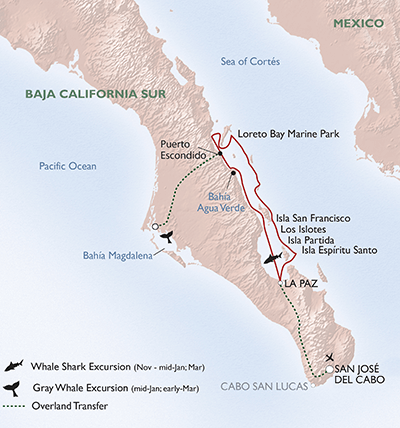 We docked at Puerto Escondido one morning and then headed by bus to the Pacific coast, to Bahia Magdalena, where gray whales come to calve in winter. We broke up into small groups and loaded into skiffs, and then cruised into the middle stretch of a large, wide lagoon. Once more, a blue sky blessed us, and despite an occasional rush of wind, the waters were fairly calm. It didn’t take long to see a massive mother whale break the surface with a graceful roll, followed by her newborn doing its best to imitate her every move. 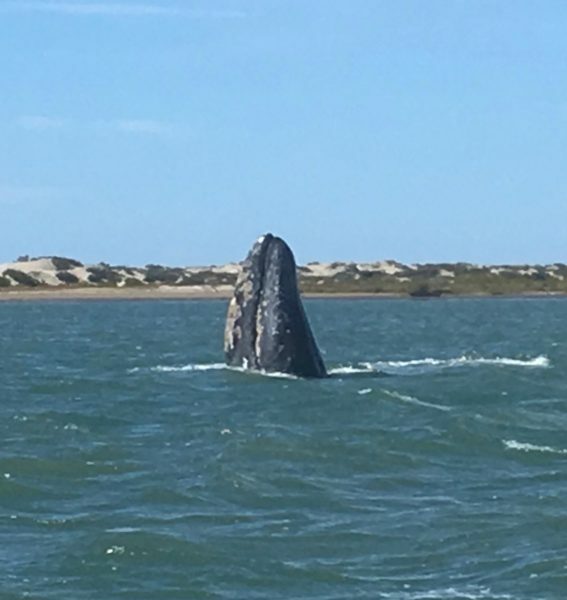 Now and then we all cheered when an adult whale would “spy-hop,” or rise nose-first out of the water just enough for its eyes to catch a look at what – or who – was around. It was heartbreaking to learn these magnificent creatures had once been hunted to near-extinction, but so heartening to find out they are now protected. In addition to snorkeling, I renewed my interest in hiking while UnCruising, as it were. 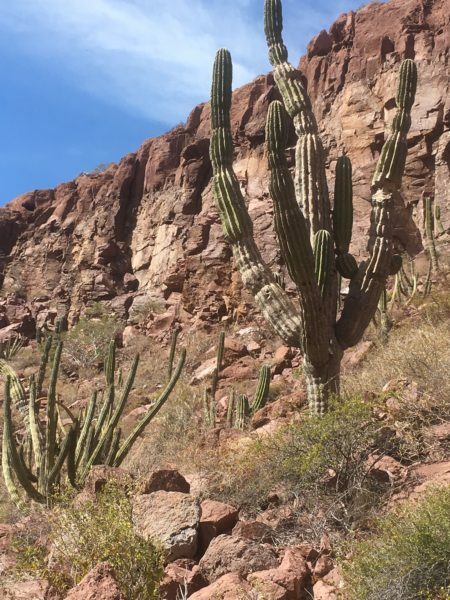 One of the more daunting hikes – no paths, just endless reaches of sun-blasted rock and battalions of tall cacti rising along a pitch much steeper than I’d anticipated – turned out of course to be the most rewarding. I huffed. I puffed. And by the time we reached the tops of the cliffs I felt a bit winded and achy. But I soon forgot all about that when looking out over the sea and beach hundreds of feet below, transfixed by breathtaking views, each one of which I felt I’d earned. Following just about every activity I showered and spent a little time stretching out in the ship’s lounge, where you could sip coffee, tea, or a drink from the bar (did I mention the open bar?). My fellow travelers ranged from Millennials to Boomers and beyond. The one thing they all shared was they were all clearly very active folks, regardless of age. And as I found out, sometimes in the lounge or over dinner or maybe an after-dinner drink (did I mention the open bar? ), most everyone I met was not just active by nature, but deeply interested in nature. Cocktail hour. Credit UnCruise Adventures. I ended up meeting and talking with many more people than I had imagined I would. There really was a communal feeling – of shared interests and fun – even if only for a week. I started to think it’s not so scary to be an extrovert. Great article, you really captured the spirit of Baja and the trip!